How you can cover your no-makeup look with a sunglasses? there how i going to show you! I got this dandelion sunglasses from Glasses Online Malaysia. just in time I going to FAM trip to kelantan. for the long hour outdoor, it is very hard to put on make up as well with all the sweat and dirts. the most proper only tinted sunblock! You even can used it as your headband. with the shape of butterfly, it can sharpen up your face figure too! great for the round face like me! it even can cover my sudden pop out pimples . 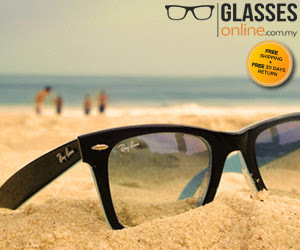 Get You Stylish Sunglasses at GlassesOnline – Malaysia’s biggest shop for sunglasses, reading glasses and contact lenses. Not only do they have the largest selection of products but they also work with the most popular brands: like the all-time Ray Ban frames, but also the modern Oakley Frogskin sunnies for the most adventurous ones.